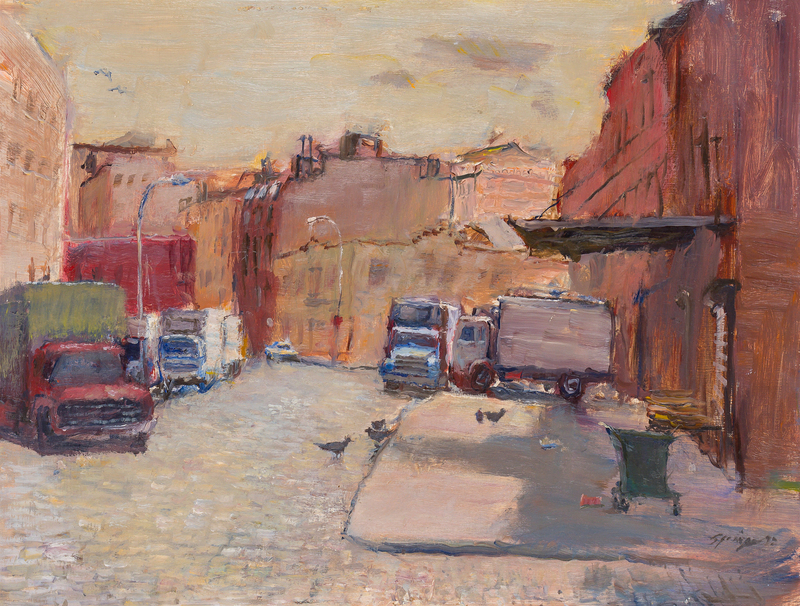 Until recently, I’d never heard of Greenwich Village painter Anthony Springer. But I’ve found myself captivated by his colorful, textural images of a less dense, less luxurious Village and other surrounding neighborhoods. 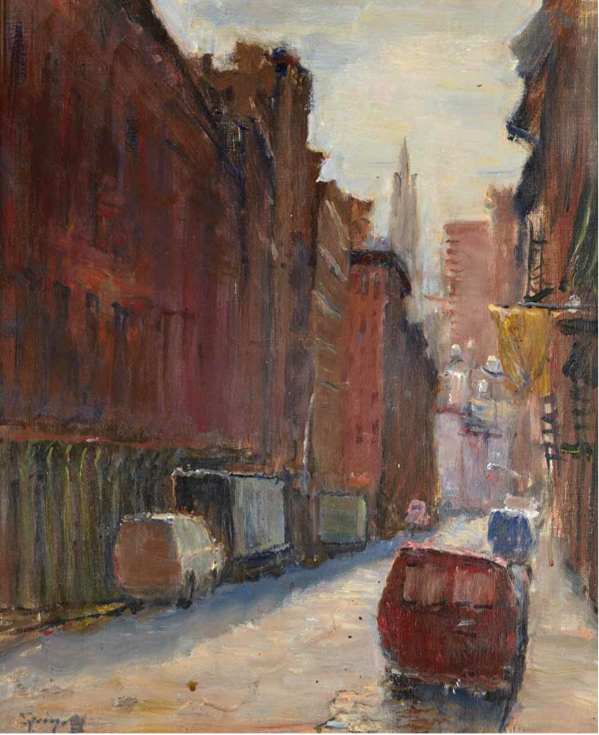 Born in 1928, Springer, a native New Yorker, worked as a lawyer before deciding to make painting his vocation at the age of 40, according to friend and fellow artist Robert Holden in 2013 on his blog, Painting Life Stories. 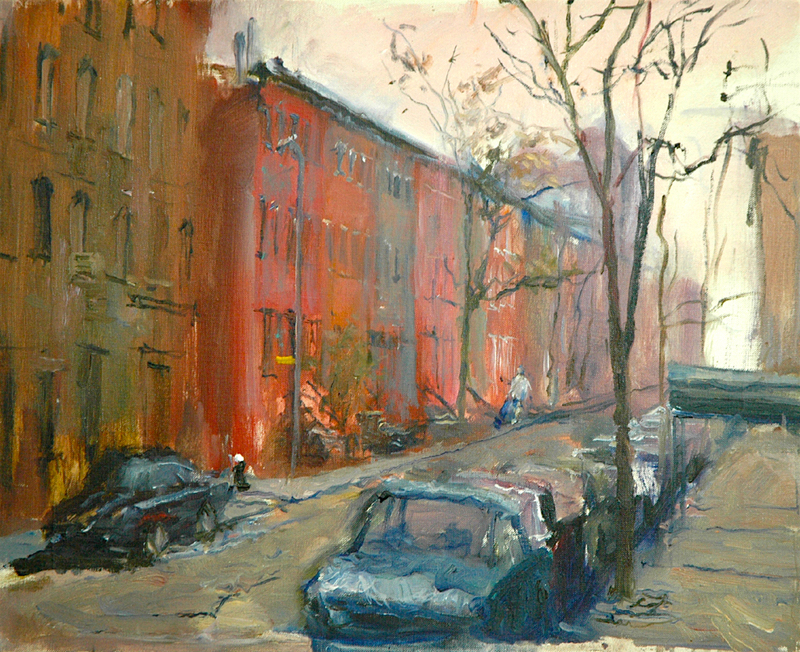 “Tony was a wonderful, quietly mysterious kind of guy, who played poker all night long, slept until the late morning, and then grabbed his half-box French easel and 16×20 inch stretched linen canvas to go paint the narrow side streets of the Village in the dusty afternoon light, a habit he kept up for 20 years or more,” wrote Holden. When he died in 1995, Springer left behind “hundreds of his beautiful, moody gray cityscapes,” he wrote. 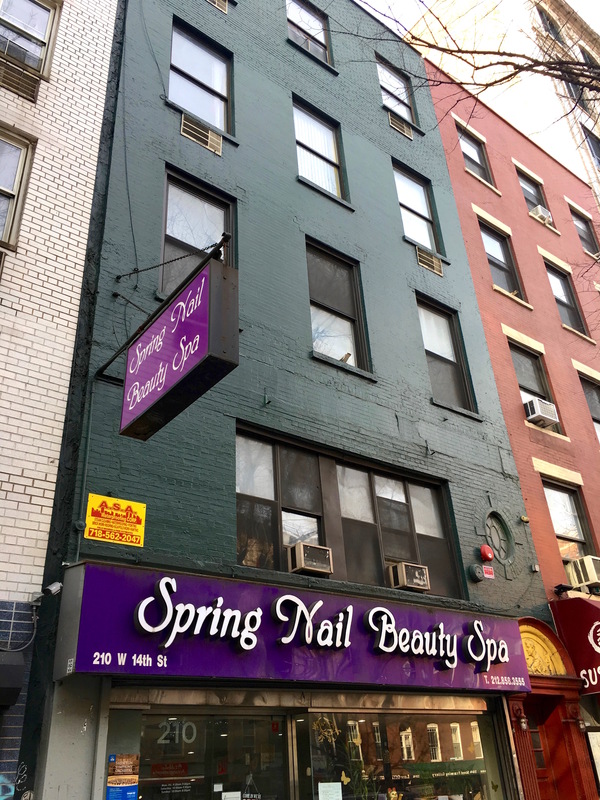 More than two decades or so have passed since Springer’s death, and his evocative work serves as a reminder of the very different pre-2000s Greenwich Village. 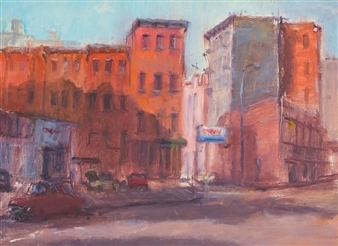 Springer’s “Meatpacking District,” at top, takes us to the Belgian block intersection of Greenwich and Gansevoort Streets. When Springer painted it, this was a daytime corner of trucks, garbage carts, and pigeons before it became an pricey restaurant playground. 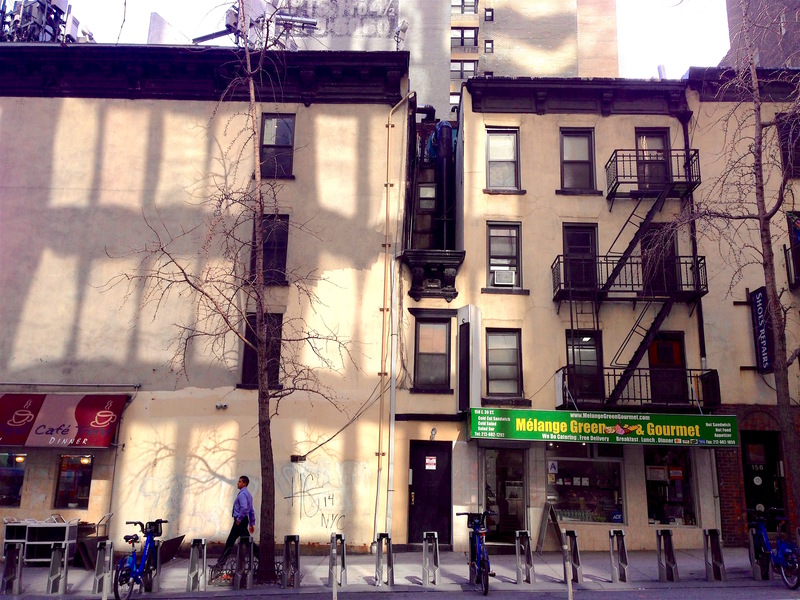 His image of a gas station amid tenements is a reminder that downtown used to actually have gas stations. Could this be the one Eighth and Greenwich Avenues? “Downtown Street” shows a quiet scene of a narrow side street and empty sidewalks. Maybe Mercer Street, or Greene Street? The last image, “Townhouses and Naked Trees,” feels appropriate for the current season with winter approaching. Hmm, Tenth Street? 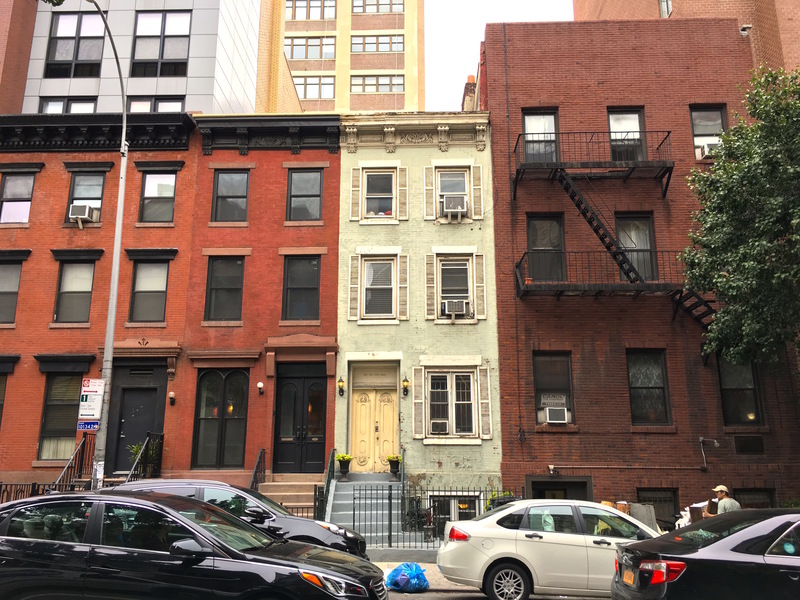 Not much has happened on Van Dam Street in the last century or so, and one gets the impression that the residents of this short street in the no-man’s-land between Greenwich Village and the western edge of SoHo like it that way. Renato? 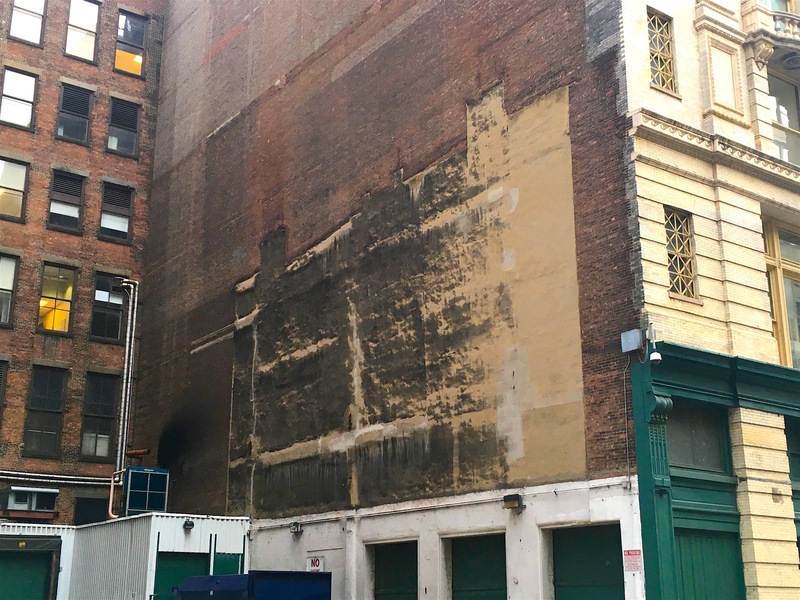 This sign (hard to see in the photo, as well as on the street) is the last vestige of the restaurant Renato’s, opened at 21 Van Dam Street 1922 and described as “fairly elusive” by The New Yorker in 1941. 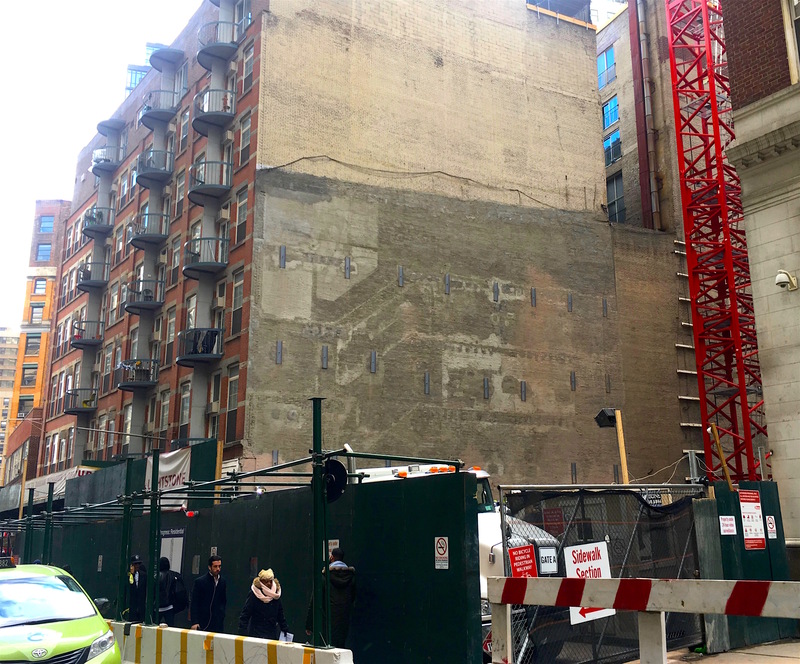 This was before SoHo was a luxury loft district, when the area was an Italian working class enclave of spaghetti houses and groceries bordering Greenwich Village. 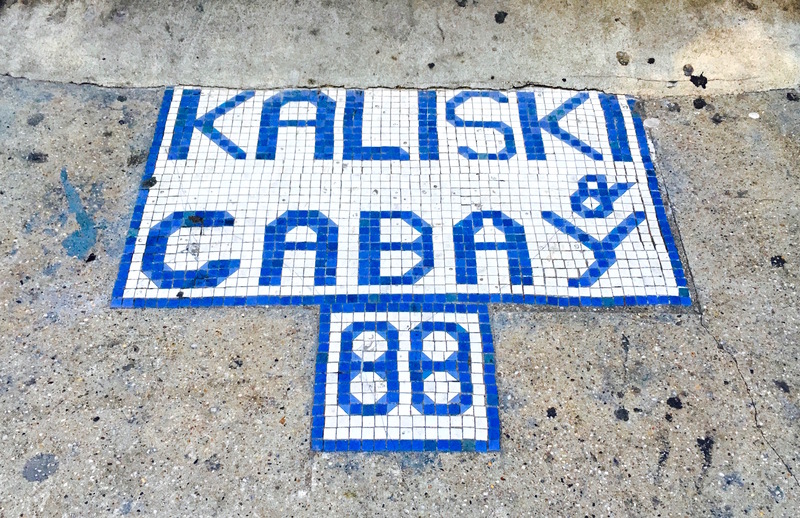 Run by Italian immigrant Renato Trebbi, the restaurant (decorated by Village resident and illustrator Tony Sarg) attracted locals, businessmen, and an artistic and celebrity clientele. 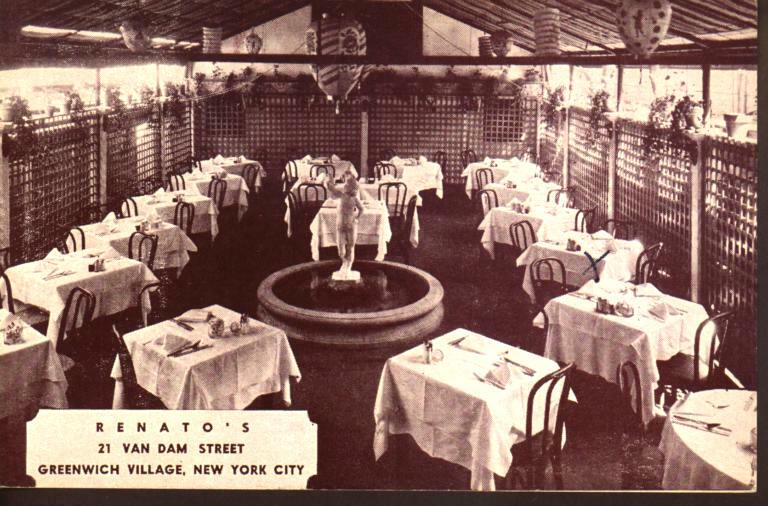 “Renato’s at lunch time is a businessman’s haven, where women are outnumbered ten to one, perhaps because the feminine appetite isn’t quite up to a four-course midday meal, which is offered for the reasonable consideration of 85 cents to $1.60,” the New York Times noted in 1945. In the 1960s, the place still sounded like a hideaway for those in the know, according to this restaurant guide written by Tom Wolfe. 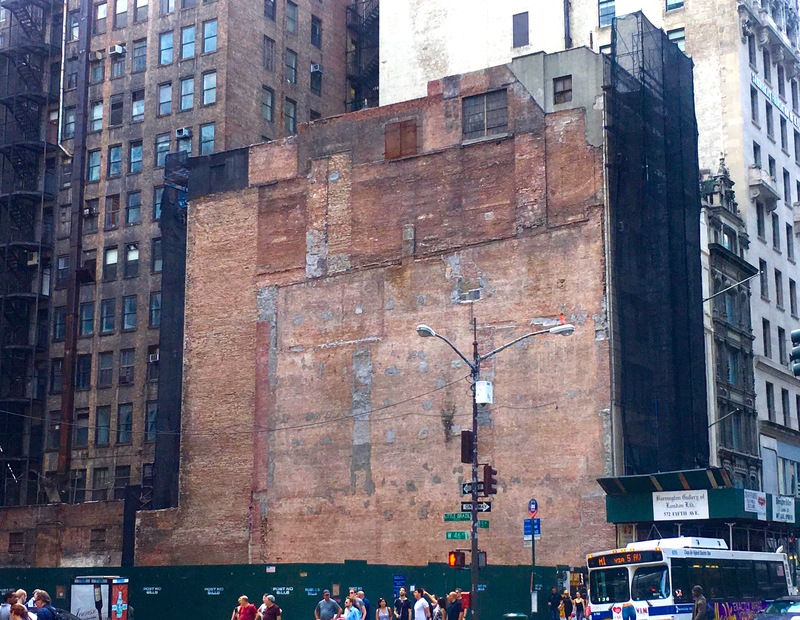 Renato’s could have ended up like Arturo’s on Houston Street or even Fanelli’s on Mercer and Prince, Italian-owned neighborhood restaurants that thrived when Soho filled up with people and tourists with money. But it’s unclear how long Renato’s lasted and if it was able to cash in on the crowds that came downtown in the 1970s and 1980s. 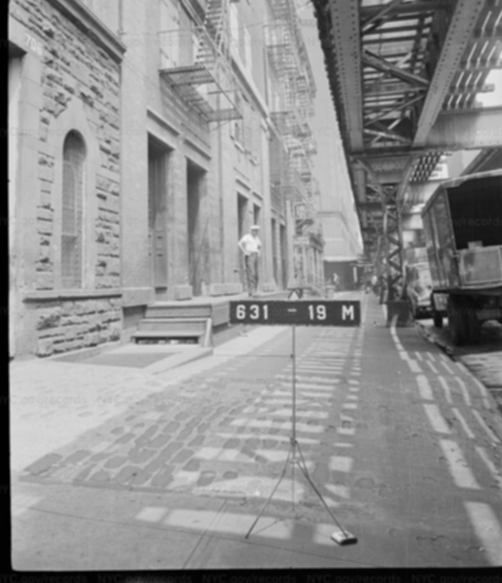 This 1975 Edmund Gillon photo from the Museum of the City of New York, above, shows the Federal houses on Van Dam Street and the Renato’s sign on number 21 at right. 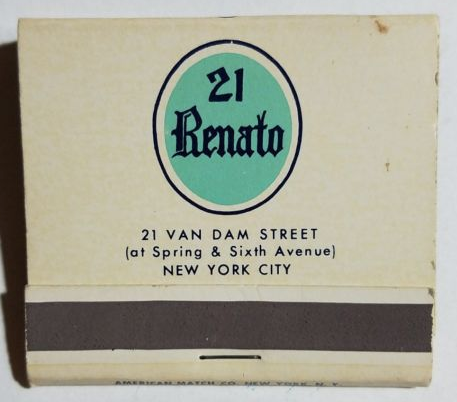 Renato himself died in New Jersey in 1985, but his sign remains. 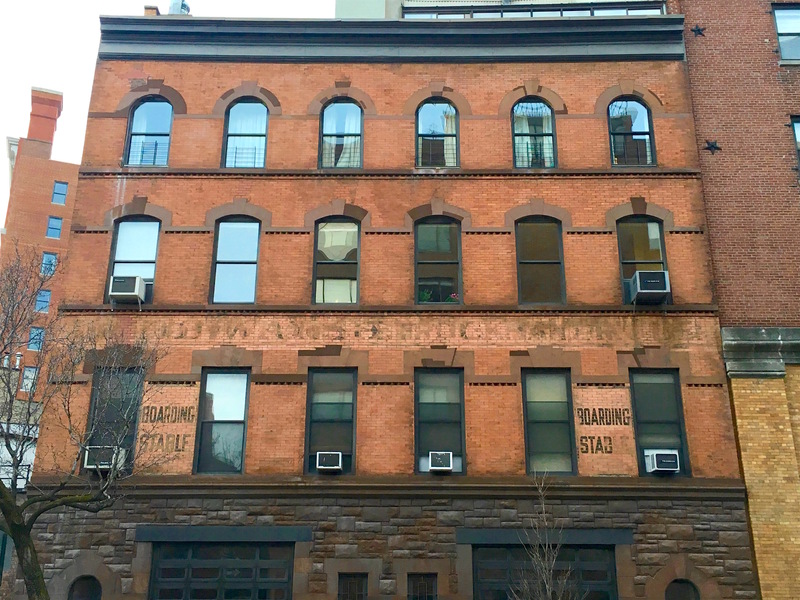 Disease can shape a city—and that’s what drove the huge population boom in the country resort of Greenwich Village in the first half of the 19th century. In the 1700s, Greenwich was a bucolic suburb dotted with estates. 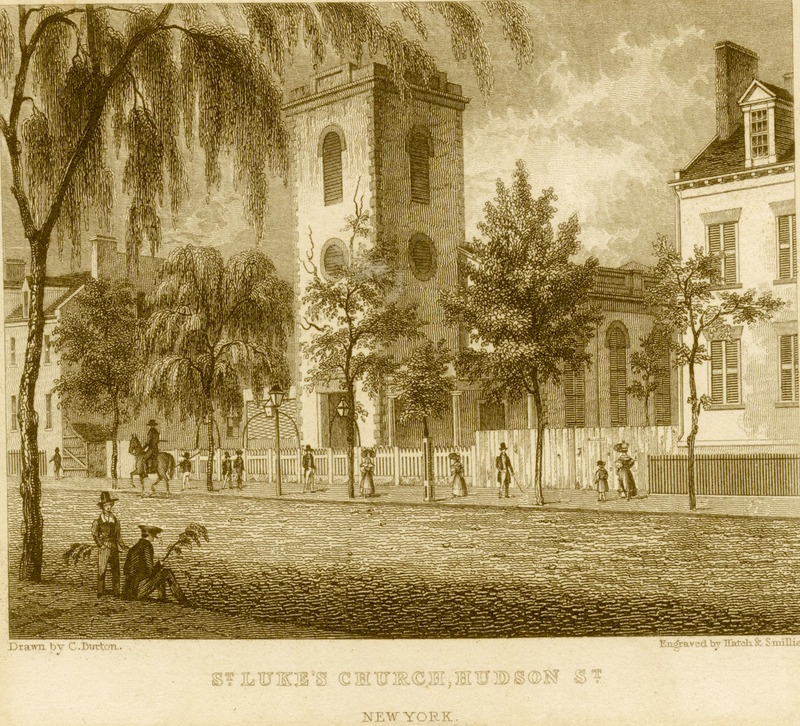 by the 1790s and early 1800s, this part of Manhattan, with its cool breezes and healthy air, was overrun with residents fleeing lethal outbreaks of yellow fever in the downtown city center. 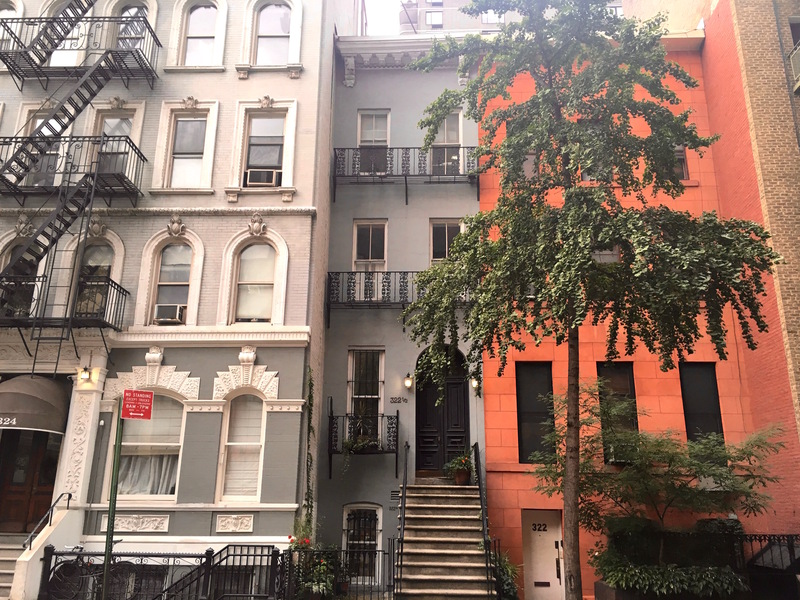 “Those marvelously healthy qualities as to location and air, that fine, sandy soil, made it a haven, indeed, to people who were afraid of sickness,” wrote Anna Alice Chapin in her 1920 book, Greenwich Village. With so many new homes going up, churches needed to be built as well. 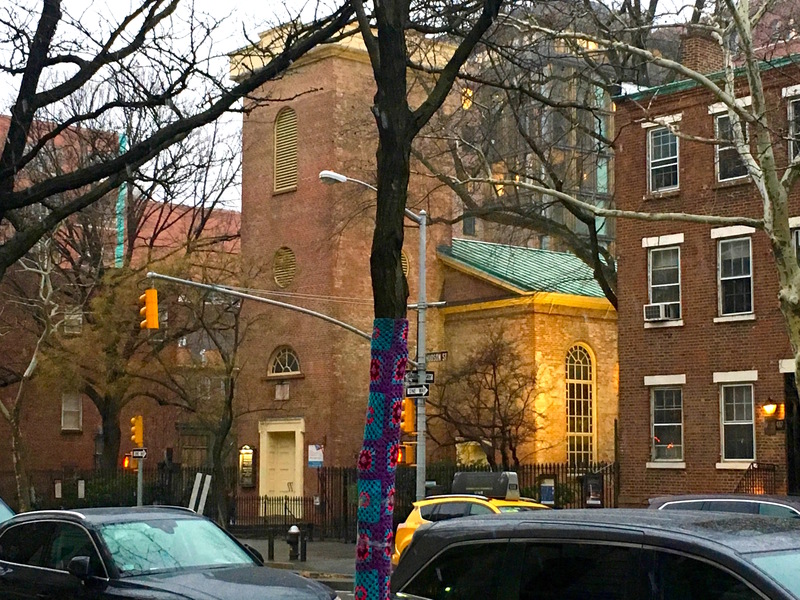 So Trinity Church decided to build a parish on Hudson Street. 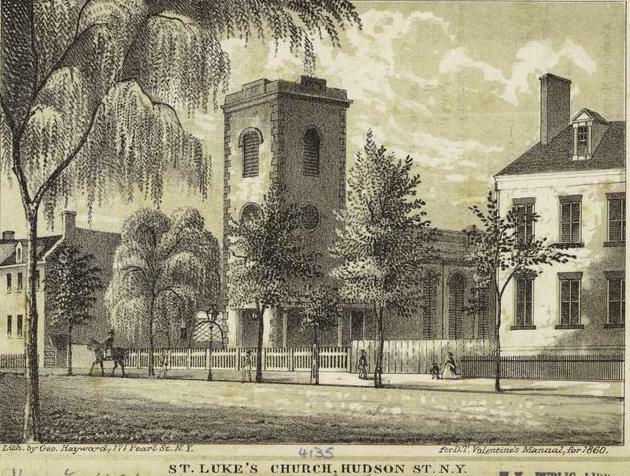 In 1820, with an assist from Clement Clarke Moore (a theology professor not yet famous for his Christmas poem whose Chelsea estate was just north of Greenwich Village), a new church was born: Saint Luke in the Fields. 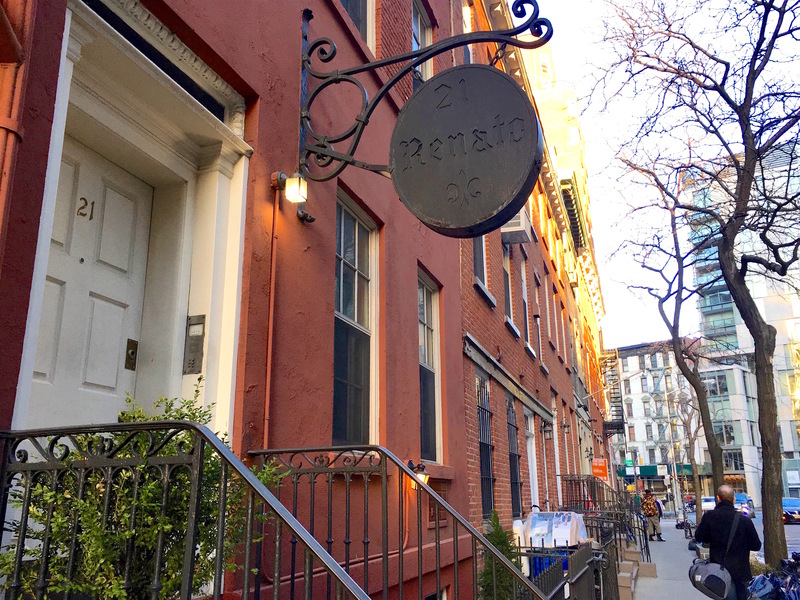 The evocative name was a reference to Greenwich Village as a countryside enclave. And Saint Luke? He’s the physician evangelist, patron saint of physicians and surgeons. His name is a nod to “Greenwich’s role as a haven for the multitudes fleeing disease in the city,” wrote Edwin G. Burrows and Mike Wallace in Gotham. The fields aren’t totally gone—St. Luke’s has one of the prettiest secret gardens of any church in New York City. Who is the man with the pen on 14th Street? I’ve been curious about him since the 1990s—this sturdy man clad in a loose-fitting shirt sitting in a chair while holding what looks like a pen to a piece of paper. 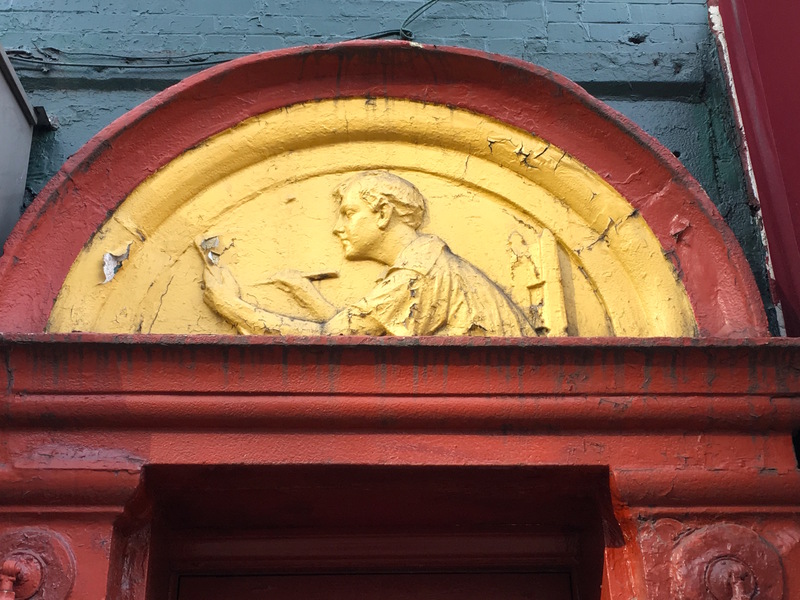 His image is carved above the doorway of the five-story walkup residence at 210 West 14th Street. Who is he? A writer I imagine, or an illustrator, or some other kind of artist. Whatever he’s doing, he seems reflective and serious, engrossed in his work. Did an artist or writer live and work here? A search of possibilities turns up something interesting. 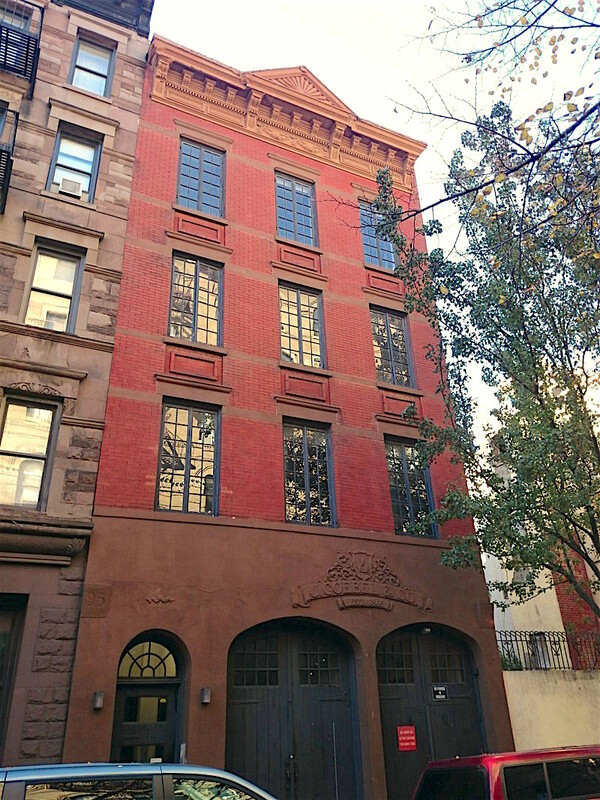 From 1942 until his death in 1968, French-born painter, sculptor, and Dada pioneer Marcel Duchamp had a studio in this building on the top floor. 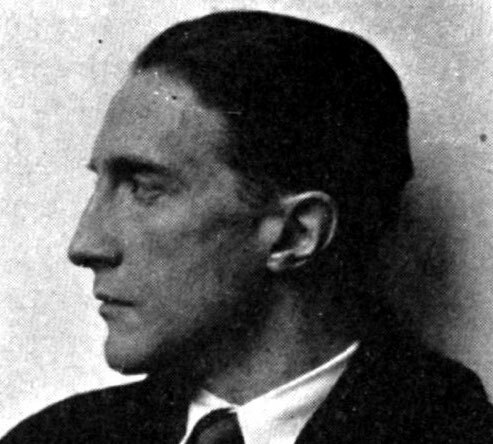 (In fact, “Duchamp” is still written on the buzzer outside the front door, a nice turn Duchamp would probably get a kick out of). 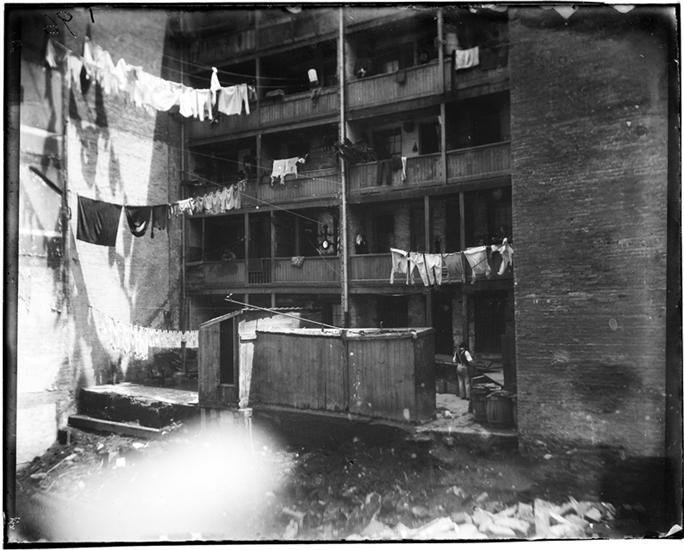 It’s one of many places Duchamp lived in the city after he first arrived in 1915. “It was here that, using found objects from his walks around the neighborhood, Duchamp secretly constructed ‘Etant Donnes,’ when the public had thought he’d given up art,” states art-nerd.com. Is the man with the pen Duchamp? It seems unlikely, based on what Duchamp actually looked like. 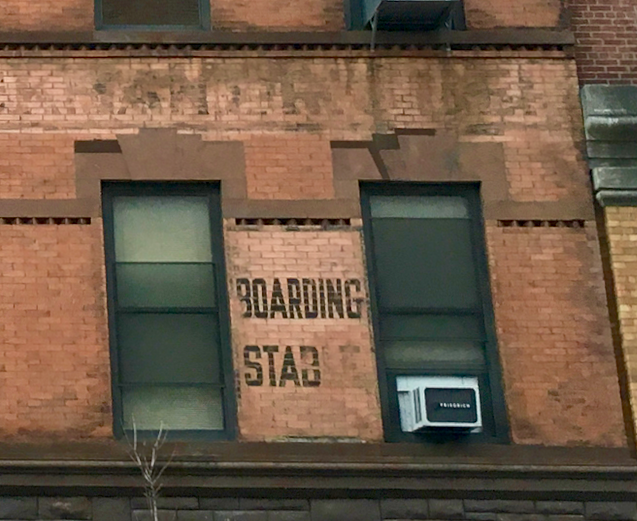 The ground-floor commercial space doesn’t hold any clues. Various tenants leased the space over the years, most notably a Spanish food store called Casa Moneo from 1929 to 1988. 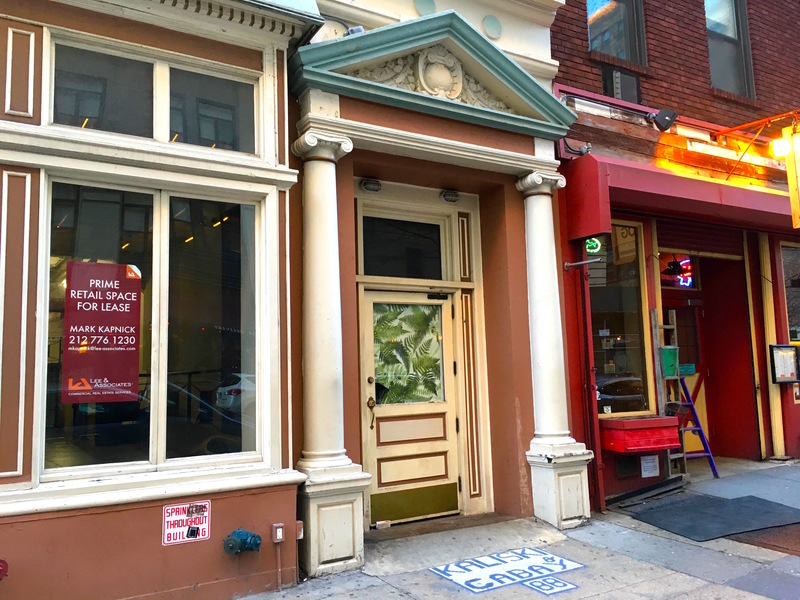 Casa Moneo was one of the last holdouts from when West 14th Street was the center of Manhattan’s “Little Spain” enclave. The identity of the man and his significance at this address remains a mystery. Was Monday the city’s official laundry day? 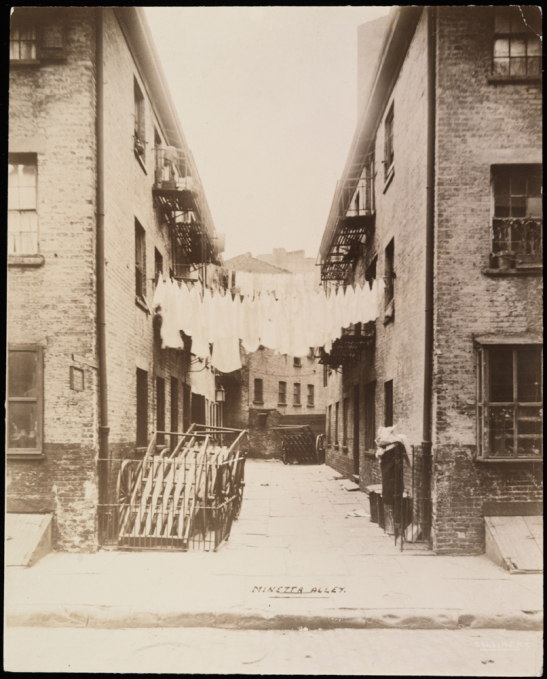 Apparently it was a traditional day to do the hard work of washing clothes, as this excerpt from Tyler Anbinder’s book about the city’s notorious 19th century slum, Five Points, explains. 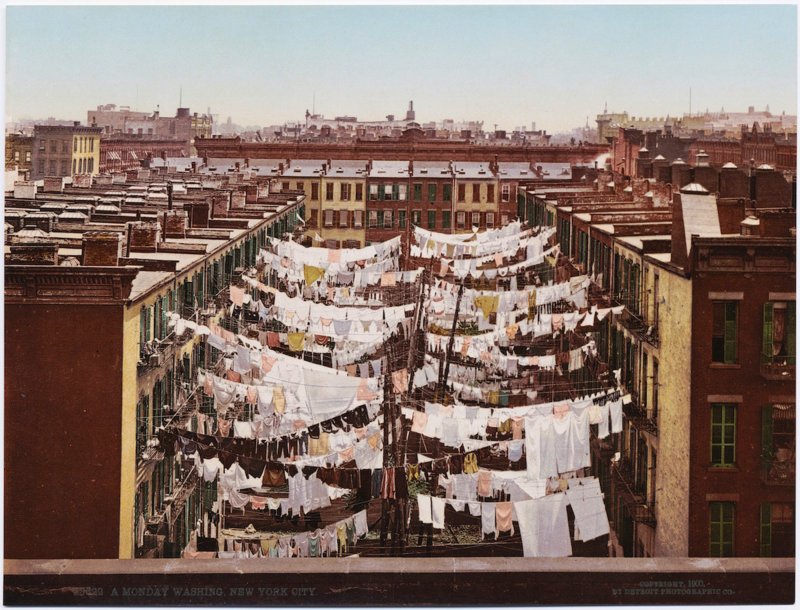 “Hard wash-days”—typically Mondays—provided some of the most unpleasant memories for tenement housewives such as those in Five Points,” wrote Anbinder. 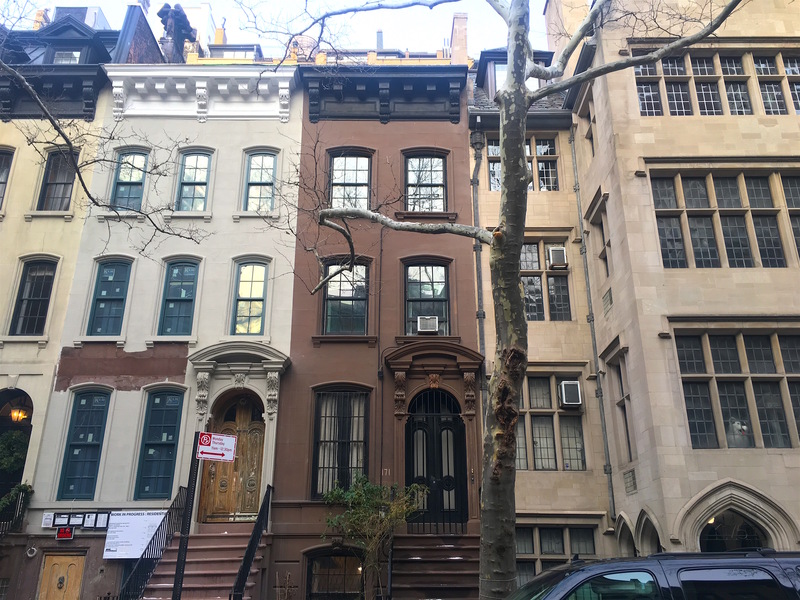 A single-family brownstone has been a New Yorker’s dream home since these “brown stone front” row houses (often made of brick with brown sandstone covering the facade) began appearing on city blocks by the middle of the 19th century. Because building lots during the brownstone era typically measured 25 by 100 feet, the average home came in at about 20 feet across, which allowed for a spacious parlor floor with two or three wide windows with decorative touches spanning each floor. 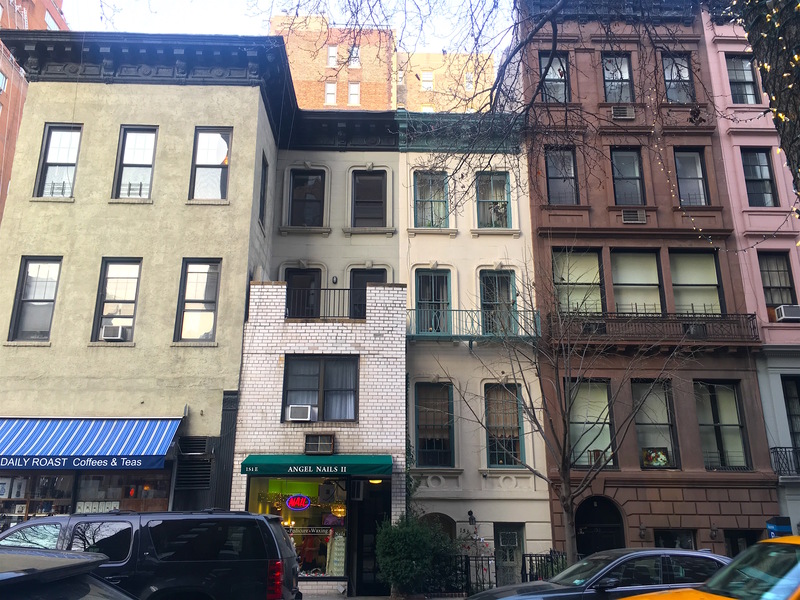 But thanks to profit-driven developers who decided to squeeze two brownstones into one lot, the cityscape of today contains a fair number of slender, narrow, skinny brownstones. 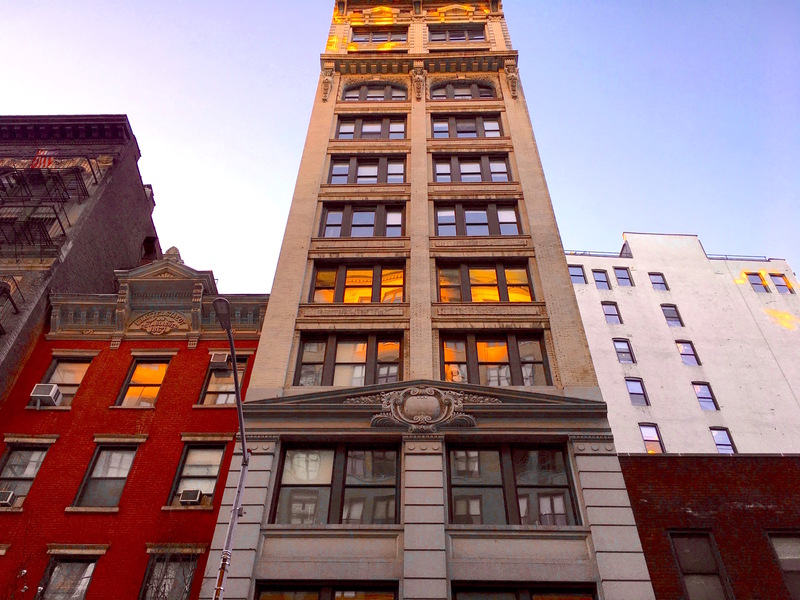 The top photo shows one in Gramercy with the same iron balconies and cornice as its wider counterparts. 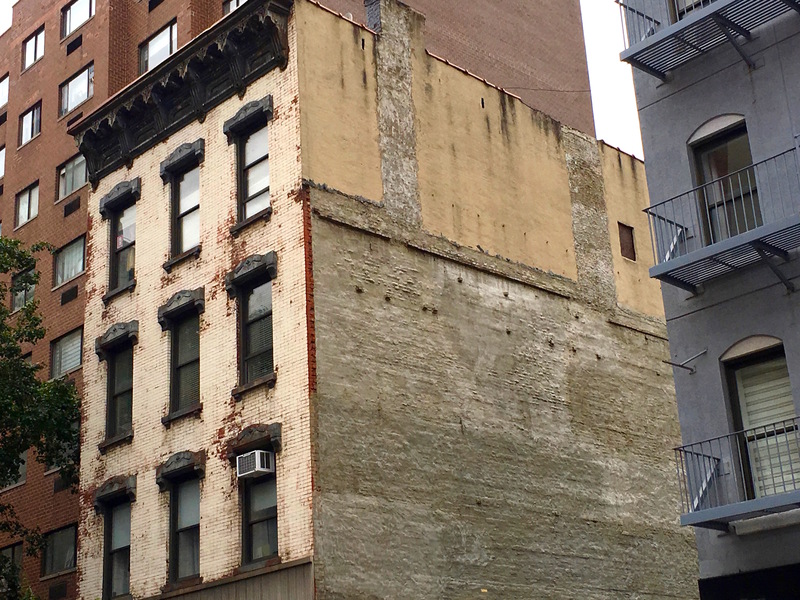 The second photo shows two compressed-looking brownstones on West 30th Street. 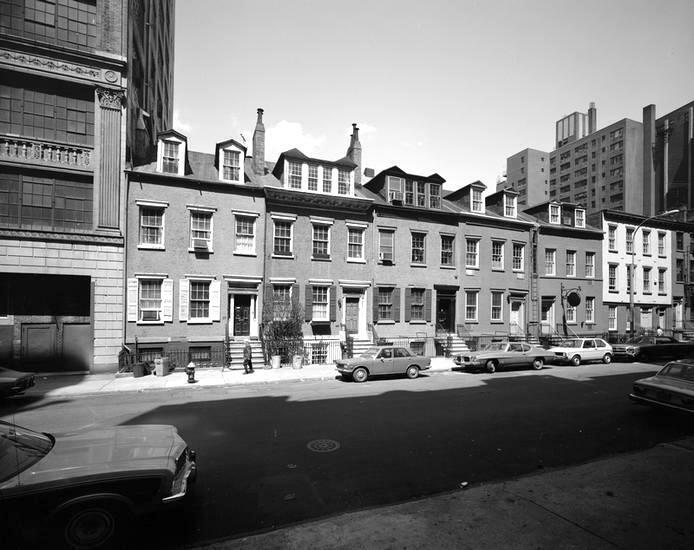 Above are two more twin narrow brownstones, looking like slender sisters, in the East 70s. 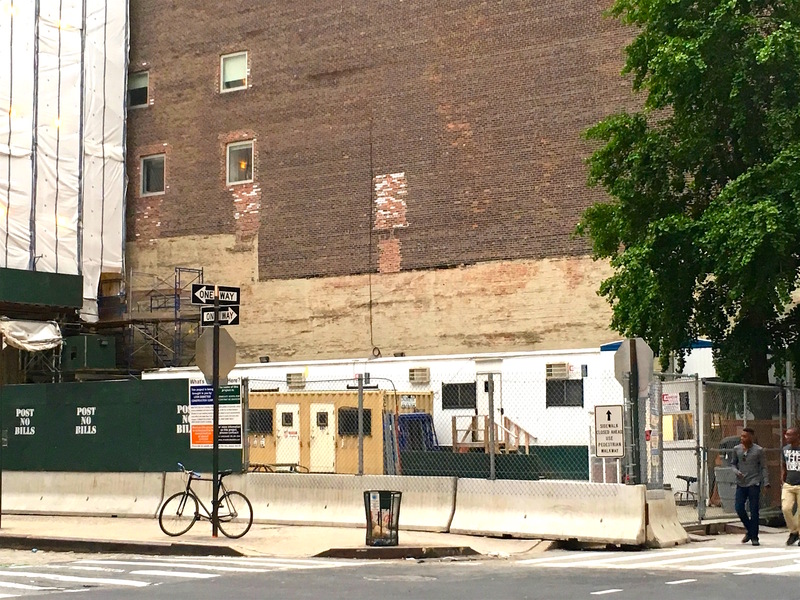 They come off as dollhouse versions of the standard-size brownstone next door. 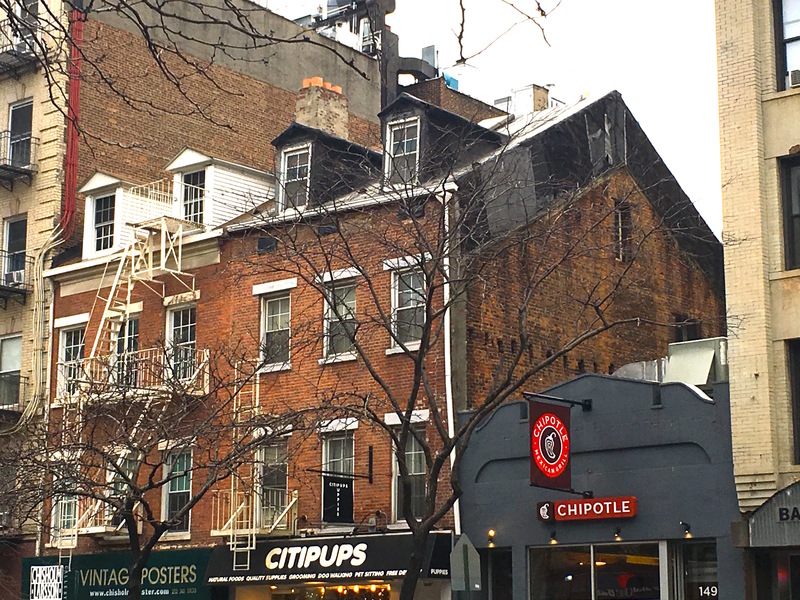 Here’s another mini-me brownstone on the same East 70s block, old New York’s answer to the tiny house craze of contemporary times. 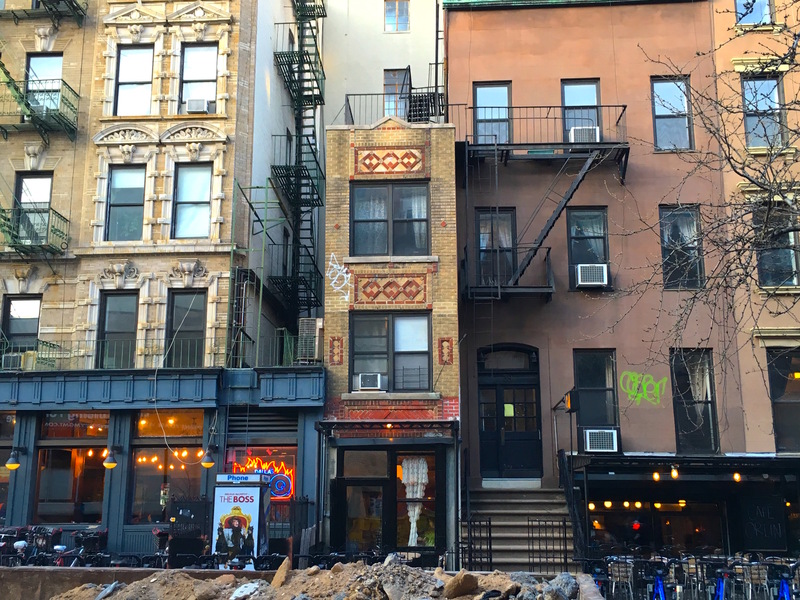 This one above in the East Village isn’t a brownstone, and it looks like it was built in the 1920s or 1930s. You can imagine a builder acquiring this thin lot and then deciding to put up this narrow rowhouse. 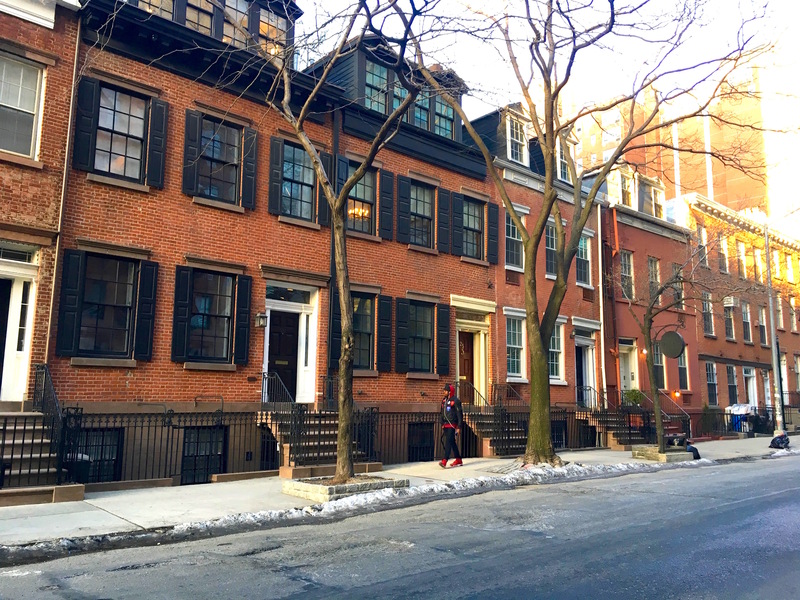 This skinny brownstone on Tenth Street, a street with spacious rowhouses collectively known as English Terrace Row, only has room for one third-floor window. 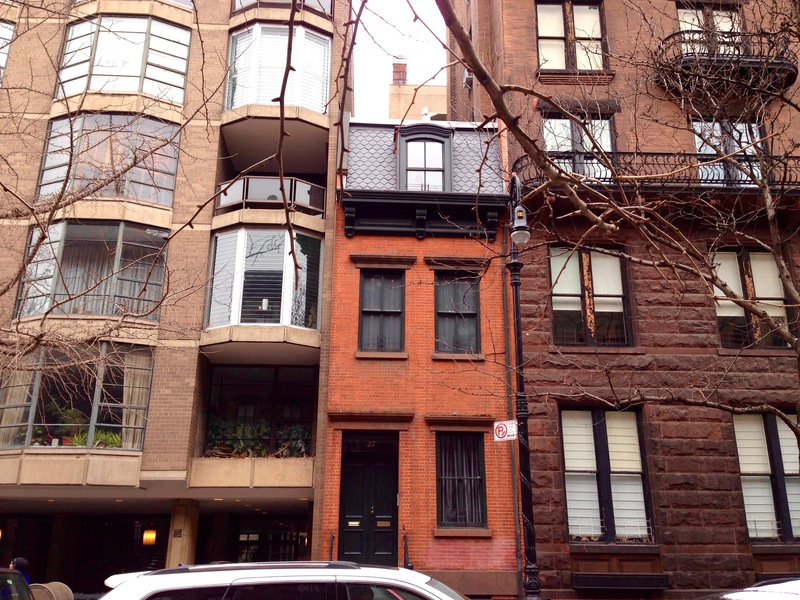 While the house in the last photo probably doesn’t qualify as an actual brownstone—I’m guessing it’s an entryway and staircase for the building to the left on East 39th Street—you have to admire the builder’s ingenuity, adding a cornice and matching window to it to pass it off as a lilliputian house on its own. Bedford Street is a stunning historic block, but there is one building on this lovely Village lane that’s always piqued my interest. 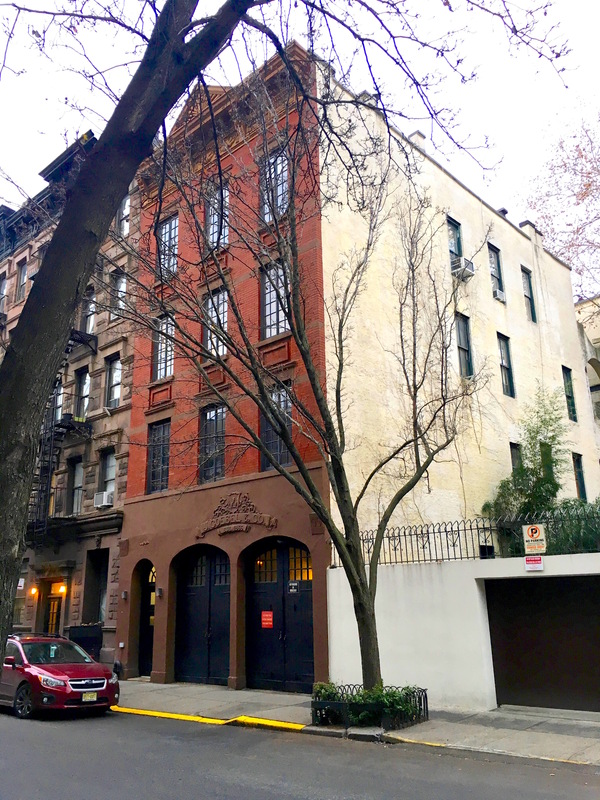 It’s number 95, a circa-1894 brick beauty with a Victorian era cornice and ground floor brownstone stable. 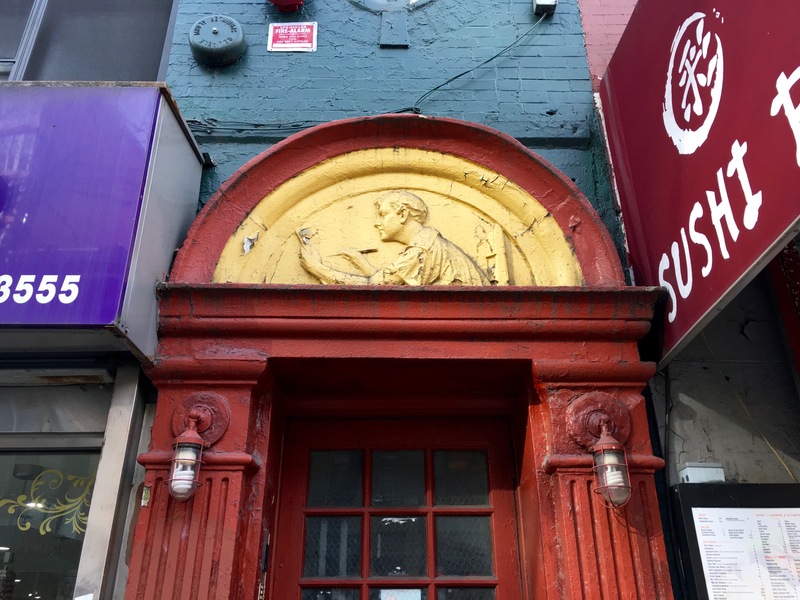 So who was J. Goebel, and what did he do at 95 Bedford Street? The clue is in the three stacked cups in the fanciful sign. No, he wasn’t a brewer, though the grapes under the cups seem to imply that. Julius Goebel was a German immigrant who either manufactured or imported crucibles made out of a rare kind of clay found in Germany. 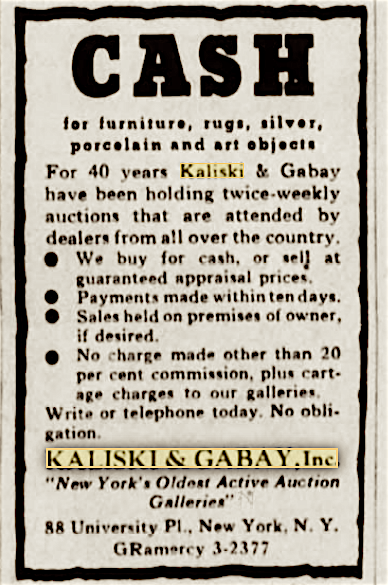 Goebel operated his business on Maiden Lane in the late 19th century, according to Walter Grutchfield. 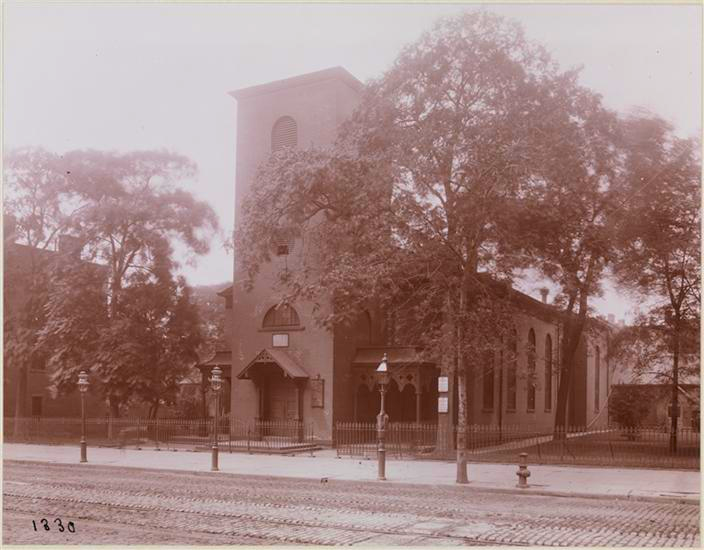 His son, who took over for him after his death, moved the company to 95 Bedford Street in the 1920s. 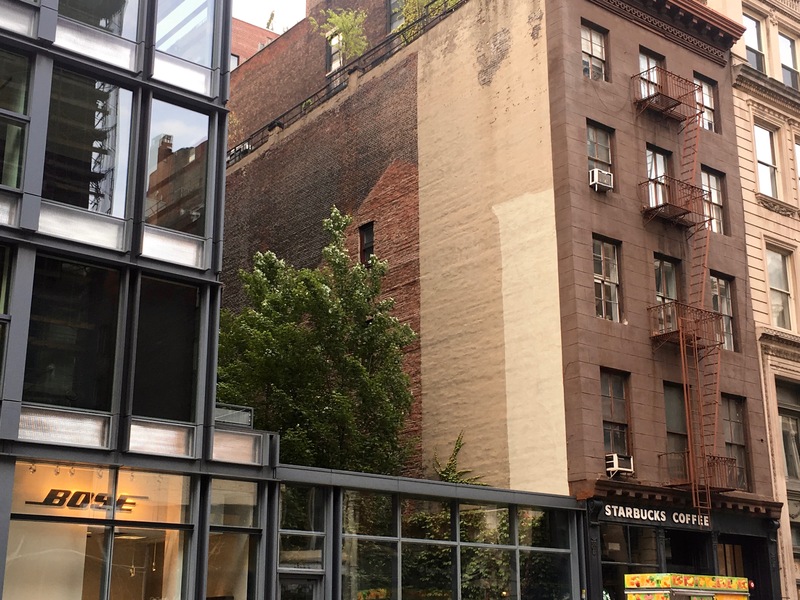 That’s the decade when the building (originally a stable) was converted to office space and into apartments, per the 1969 Landmarks Preservation Committee report. 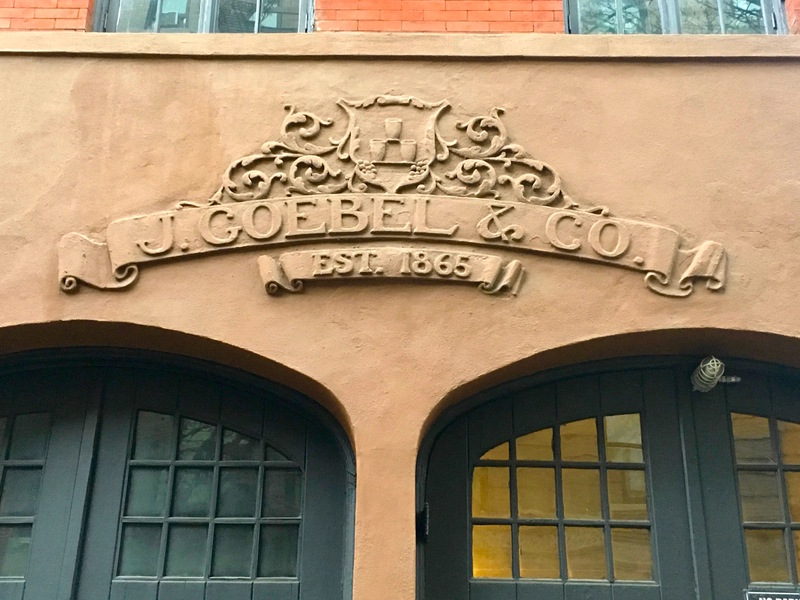 The established-in-1865 thing is likely a nod to the year Goebel started his company—and it could very well be the year he landed in New York, a turbulent year indeed.